Love Dungeons & Dragons Games? Seeking Dungeons & Dragons comics, books, and games? 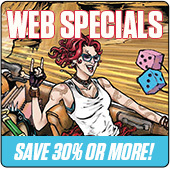 Start a campaign to complete your collection and save 10-50% every day at TFAW.com! Since its debut in 1974, D & D has been the most popular role-playing game in the world, spawning novels, comic book series, collectibles, and more. Browse below and stock up on your favorite items! Generations have passed since the original Heroes of Baldur's Gate saved the city and the Realms. Now a new threat rises. Legal Notice: Entire contents trademarked (® or TM) and copyrighted (©) 1986-2019 by Things From Another World, Inc. and respective copyright and trademark holders. All rights reserved. Page rendered at 2019-04-19 07:31:44 in 0.223 seconds.